Katie Holmes: Katie’s weight loss could keep her from getting pregnant. Nicole Richie: Is Nicole going too far with her diet? Nicky Hilton: Nicky is in total denial. Britney lost 15 lbs in just 4 weeks! Don’t let the rest of the world tell you that you’re too fat or too skinny. Make a decision on your own based on how you feel and how your body is reacting to your current weight. The worst part about the OK! Magazine covershot… that photo of Britney is from when she was 22 for a shot for glamour magazine. Proof. 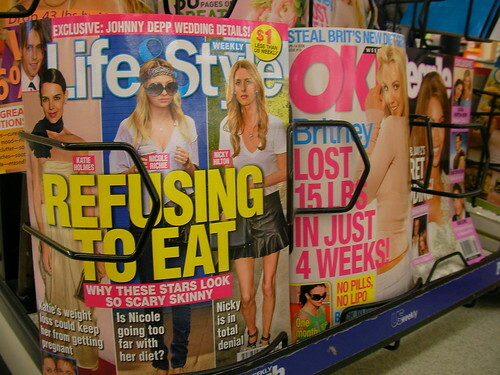 You know, every time I go to the grocery store, I see these tabloids, and I think we’re sending our kids the wrong message! I struggle to work out every day and to see stars starving themselves to be thin, makes me ill. There is a healthy way to do everything, I wish people could just be themselves. The funny thing is that I saw two different tabloids – one with a shock headline about Lindsey Lohan being horribly thin and the other about Lindsey Lohan’s new diet pill – using the SAME PHOTO. The tabloid papers are laughable. A lot of their “news” is invented, not researched. And as for the skinny or otherwise “stars” of the Hollywood set, you can file a lot of that under “who cares” – tabloids are nothing but junk food for the mind. And we all know that junk food isnt healthy !